How do we find a photograph from a large archive which contains thousands or millions of pictures? How does a CNN video journalist find a specific clip from the myriad of video tapes, ranging from historical to contemporary, from sports to humanities? How do people organize and search the content of personal video tapes of family events, travel scenes, or social gatherings? The era of "the information explosion" has brought about the wide dissemination and use of visual information, particularly, digital images and video, which we are also seeing in combination with text, audio, and graphics. The development of tools and systems that enhance image functionalities, such as searching and authoring, is critical to the effective use of visual information in the new media applications. The current research and development of images and video search tools is driven by practical applications. We are seeing the establishment of large digital image and video archives, such as the Corbis catalog, which includes the Bettman Archive; the Picture Exchange, which is a joint venture between Kodak and Sprint; and many digital video libraries in various domains (e.g., environment, politics, arts), such as the on-line CNN news archives. The systems for the search and retrieval of images and video from these archives require the development of efficient and effective image query tools. The use of comprehensive textual annotations provide one method for image and video search and retrieval. Today, text-based search techniques are the most direct, accurate, and efficient methods for finding "unconstrained" images and video. Text annotation is obtained by manual effort, transcripts, captions, embedded text, or hyperlinked documents. In these systems, keyword and full text searching may be enhanced by natural language processing techniques to provide great potential for categorizing and matching images. The searching of images by their visual content complements the text-based approaches. Very often, textual information is not sufficient. Visual features of the images and video also provide a description of their content. By exploring the synergy between textual and visual features, these image search systems may be further improved. However, it is a significant challenge to automatically reconcile inconsistence between input from these features. Many content-based image search systems have been developed for various applications. There has been substantial progress in developing powerful tools which allow users to specify image queries by giving examples, drawing sketches, selecting visual features (e.g., color and texture), and arranging spatial structure of features. Using these approaches, the greatest success is achieved in specific domains, such as remote sensing and medical applications. The reason is that in constrained domains, it is easier to model the users' needs and to restrict the automated analysis of the images, such as to a finite set of objects. The integration of computer vision and image processing promises a wealth of techniques for solving the image and video search problems. But new challenges remain. In unconstrained images, the set of known object classes is not available. Also, use of the image search systems varies greatly. Users may want to find the most similar images, find an appropriate class of images, browse the image collection quickly, and so on. One unique aspect of image search systems is the active role played by users. By modeling the users and learning from them in the search process, we can better adapt to the users' subjectivity. In this way, we can adjust the search system to the fact that the perception of the image content varies between individuals, or over time. The general system architecture for a content-based visual query system is included in Figure 1. The analysis of images and feature extraction plays important roles in both off-line and on-line processes. Other important aspects of the system include the closed interaction loop (including users), the supporting database components for retrieval and indexing, the integration with multimedia features, and the efficient user interfaces for query specification and image browsing. Figure 1. A general CBVQ system architecture. The search of images is an emerging field with many exciting research challenges. The research tasks are practical, important, but not easy. In the following, we present our research strategies, prototype systems for image/video search, and our views on the important open research issues. We present our strategies for tackling the above challenging issues in this section. Although today's computer vision systems cannot recognize high-level objects in unconstrained images, we are finding that low-level visual features can be used to partially characterize image content. These features also provide a potential basis for abstraction of the image semantic content. The extraction of local region features (such as color, texture, face, contour, motion) and their spatial/temporal relationships is being achieved with success. We argue that the automated segmentation of images/video objects does not need to accurately identify real world objects contained in the imagery. Our goal is to extract the "salient" visual features and index them with efficient data structures for fast and powerful querying. Semi-automated region extraction processes and use of domain knowledge may further improve the extraction process. In the later sections, we discuss the use of automatically extracted spatial/color regions for image search, and the integration of multiple visual features for video object indexing. We use a hierarchical object based schema for feature indexing and high-level object abstraction  (see Figure 2). The fusion of multiple visual features improves the region extraction process. We also show that the aggregation of regions into higher level objects is influenced by the spatial/temporal relationships of the regions. For example, Figure 3 shows the results of automatic video object segmentation and tracking. The visual features and spatial/temporal attributes of regions generate an index for searching for the video objects stored in the archive. Figure 2. A hierarchical object based schema for images/video. Figure 3. 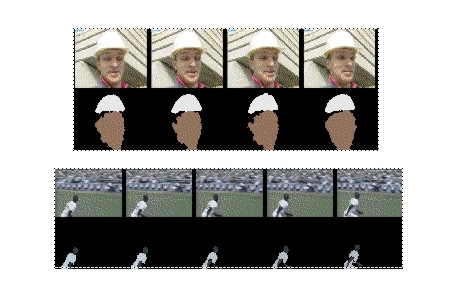 Examples of automatically segmented and tracked video objects. It's impossible to anticipate the users' needs completely at the feature extraction and indexing stage. The ideal solution is that images and video are represented (for compression also) in a way that is amenable to dynamic feature extraction. Today's compression standards (such as JPEG, MPEG-1, MPEG-2), are not suited to this need. The objective in the design of these compression standards was to reduce bandwidth and increase subjective quality. Although many interesting analysis and manipulation tasks can still be achieved in today's compression formats (as described later), the potential functionalities of the images were not considered. However, recent trends in compression, such as MPEG-4 and object-based video, have shown interest and promise in this direction. The goal is to develop a system in which the video objects are extracted, then encoded, transmitted, manipulated, and indexed flexibly with efficient adaptation to users' preference and system conditions. To break the barrier of decoding semantic content in images, user-interaction and domain knowledge is needed. These systems learn from the users' input as to how the low-level visual features are to be used in the matching of images at the semantic level. For example, the system may model the cases in which low-level feature search tools are successful in finding the images with the desired semantic content. In this way, the categories can be monitored and better analyzed by the system. Learning and other techniques in artificial intelligence provide great potential for these systems. If the applications require the definition of specific semantic subjects, the feature models of images in these classes are constructed by hand and then used to match objects in the unknown images/video. This object recognition and subject classification method provides a system for on-line information filtering. We see great potential for improving image search systems to link the low-level visual features with high-level semantics. However, in unconstrained application domains, we expect only moderate success early on. Exploring the association of visual features with other multimedia features, such as text, speech, and audio, provides another potentially fruitful direction. Our experience indicates that it is more difficult to characterize the visual content of still images compared to video. Video often has text transcripts and audio that may also be analyzed, indexed, and searched. Also, images on the World Wide Web typically have text associated with them. In this domain, the use of all potential multimedia features enhances image retrieval performance. We have developed several content-based visual query prototype systems. WebSEEk and VisualSEEk explore the problem of efficiently searching large image archives. WebClip focuses on browsing, search, and content editing of networked video. (2) the associated text is parsed, and utilized to classify the images into subject classes in a customized image taxonomy (including more than 2000 classes). More than 650,000 unconstrained images and video clips from various sources have been indexed in the initial prototype implementation. Users search for images by navigating through subject categories, or by using content-based search tools. The details of the system design and operation are described in . One objective of WebSEEk is to explore the synergy between visual features and text. We also demonstrate the feasibility of image searching in a large scale testbed, the World Wide Web. We are developing more sophisticated content-based image search techniques in the VisualSEEk system . VisualSEEk enhances the search capability by integrating the spatial query (like those used in geographic information systems) and the visual feature query. Users ask the system to find images/video that include regions of matched features and spatial relationships. Figure 4 shows a query example in which two spatially arranged color patches were issued to find images with blue sky and open grass fields. Figure 4. An example query using VisualSEEk. For video, we have developed a system called WebClip , which allows for efficient browsing and editing of compressed video over the Web. One objective is to demonstrate the benefits of using compressed video without full decoding during the content analysis and manipulation stages. Visual features (like scene changes, foreground motion objects, and icon streams) can be extracted directly from the compressed video. Web users do not need high-end video decoding or processing facilities like those used in professional studios. Another objective of WebClip is to integrate the search and editing functionalities in the same environment. Tools developed in image search systems (like the above mentioned WebSEEk and VisualSEEk systems) are being ported to the video system. We are also adding new tools for searching by motion feature and temporal characteristics. After retrieval of matched video clips, the users use web-based tools to edit the video and compose new presentations with various video special effects. The time-based model hierarchically lays out the icons of key frames from each video scene. This allows for rapid inspection of video content according to a sequential order of time. The story-based model recognizes (automatically or manually) the story structure within the video (e.g., a complete news story) and groups all video scenes belonging to the same story under a single node in the tree. The feature-based model clusters all video scenes to classes within each of which all video scenes have similar visual features. We have also undertaken new efforts to extend the joint spatial/feature query tools of the VisualSEEK system to the video domain. Video is indexed and searched by spatial/temporal relationships and visual features of video objects contained in the video sequence. Figure 5. Functionality components of WebClip. Most of the test images and video in our testbed are collected from the public domain, including data on the Web, copyright free photograph stock from commercial CD's, MPEG simulation test video, and proprietary content from local research groups. Features extracted from these images are stored in our SGI ONYX-based server, which has 50GB storage space on disk arrays, and 50GB tertiary space on a tape archive. Network facilities include standard Internet connections (via a T-3 line to outside), ATM connections within the campus and with external wide area networks (NYNET), and internal wireless networks running mobile IP. A video-on-demand (VoD) system which supports software-based video servers, MPEG-2 transport, and heterogeneous client terminals has been developed in the Image and Advanced TV lab. We envision the integration of our search systems with the VoD system soon to provide integrated image services. An important work plan for the near future is the collaboration with faculty and students in the School of Journalism and at Teachers College, Columbia University. User studies and performance evaluation are being conducted in the news and education domains. One example is the Columbia Digital News Systems group , which integrates our efforts with others on information tracking, natural language processing, and multimedia briefing. Image/video searching is a relatively new field, but it has many exciting research issues. It requires close interaction between multiple technical disciplines and applications users. Researchers have made great progress in recent years, but a few critical issues have still not been addressed adequately. In particular, we believe that further breakthroughs need to be made in the following areas before image search systems can make significant impacts on real applications. Today, there are no satisfactory methods for measuring the effectiveness of image search techniques. Precision/recall types of metrics have been used in some of the literature but are impractical due to the tedious process of measuring image relevancies. There are no standard image corpus or benchmark procedures. We believe that resolution of this issue is of top priority for researchers and users in this field. (3) fast enough to re-process existing data in the archive. The degree of time urgency decreases in the same order. All these aspects demand breakthroughs in image/video representation and dynamic content analysis. Today's content-based image search systems allow for image queries based on image examples, feature specification, and primitive text-based search. The WebSEEk system uses automatically extracted text in image subject classification. Other researchers have also shown some success in using newspaper photograph captions and video transcripts to assist visual content analysis. Adaptive visual feature organization through user interaction has also been proposed. But the linkage between low-level visual features and high-level semantics is still very weak. Non-technical, general users tend to expect the same level of functionalities as those seen in today's text search systems. We admit that this is a difficult objective. But, as they are driven by critical application needs, image search systems will benefit from any breakthrough made in this direction. This project is supported in part by the ADVENT industry partnership project at the Image and Advanced TV Lab of CTR, Columbia University, Columbia Digital Library project, and National Science Foundation (IRI-9501266). We appreciate the research collaboration in this area with Dr. Chung-Sheng Li of IBM, Dr. Kenrick Mock of Intel, Dr. Harold Stone of NEC, Dr. HongJiang Zhang of Hewlett-Packard, and Mr. Jan Stanger. 5. A. Aho, S.-F. Chang, K. McKeown, D. Radev, J. Smith, and K. Zaman, "Columbia Digital News Systems," to appear in Workshop on Advances in Digital Libraries, 1997. Approved for release, February 14, 1997.